Fastbind Elite XT EVA Hot Melt binding machine offers the greatest flexibility up to the largest formats for hard and soft cover books, tear-off pads, and more. Fastbind Elite XT can bind books up to 450 x 320 mm (17.7" x 12.5") portrait or letter landscape. This is ideal for print/copy shops, binderies, school yearbooks and photographers. The end result is a strong, square and affordable perfect bound book. 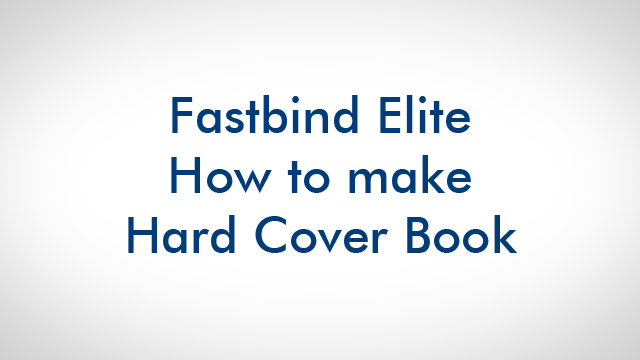 With the Fastbind Elite, it is easier than ever to bind hard cover books. Just insert your cover. Block it. Insert the content between endpapers. Turn and apply the glue to the spine. Turn back and release the book. Apply pressure to form the groove on both sides. Your book is ready. No adjustments between sizes from matchbox up to A4+. The Fastbind Elite XT features the exclusive Paper Grain Opening (“PGO”) system. Unlike other spine rougheners that grind the spine creating lots of noise and dust, the PGO opens the paper grain with very little noise and there is no paper dust! The operator can control the number of PGO passes that need to be made, to ensure a strong bind. Easier to learn than an office copier! Anyone can be making professional quality books and reports in minutes. It self adjusts for book thickness from 1 to 1000 pages. For the best quality, it is also possible to move the paper stopper to one of the three predefined fastening places for ledger, letter or statement standard formats. The optional hard cover toolkit consists of a nipping bar and a special paper guide. The special shape of the bar gives professional look to the finished book.